Though part of me was disappointed that I couldn’t be closer to the Bay Area during their march to the NBA title. Luckily, a work trip coincided with game six of the NBA Finals so I was able to watch the Warriors capture the NBA title at Hi-Tops in San Francisco. It was great being in San Francisco to celebrate the region’s first NBA championship in 40 years, but my GSW Bay Area work wasn’t finished. I also had the goal of buying a Warriors t-shirt (off the street, for less than $10) as well as checking out a badass Steph Curry mural that I came across on some blogs while on the other side of the country. The mural dedicated to the NBA’s MVP popped up during the NBA Finals. Created by the Illuminaries, two Asian street artists Tim Hon and Steve Ha, the mural is locked behind a fence on 27th street and Northgate near highway 24 in Oakland. 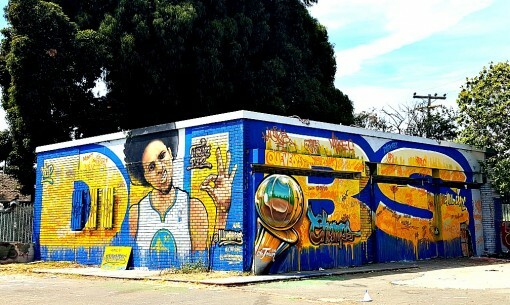 The two-walled mural features Oakland’s favorite Steph Curry sporting an afro “in the pose of Mac Dre, who is a local Bay Area [rap music] legend who passed away a few years ago“. Curry is flashing the popular “three” sign over a graffiti’ed blue and yellow “DUBS” background.